The Washington Nationals will play two Sunday, sending a split squad to Port St. Lucie to face the division rival New York Mets for the last time before Opening Day and keeping another one back at the FITTEAM Ballpark of the Palm Beaches to close out spring training with their complex partners, the Houston Astros. 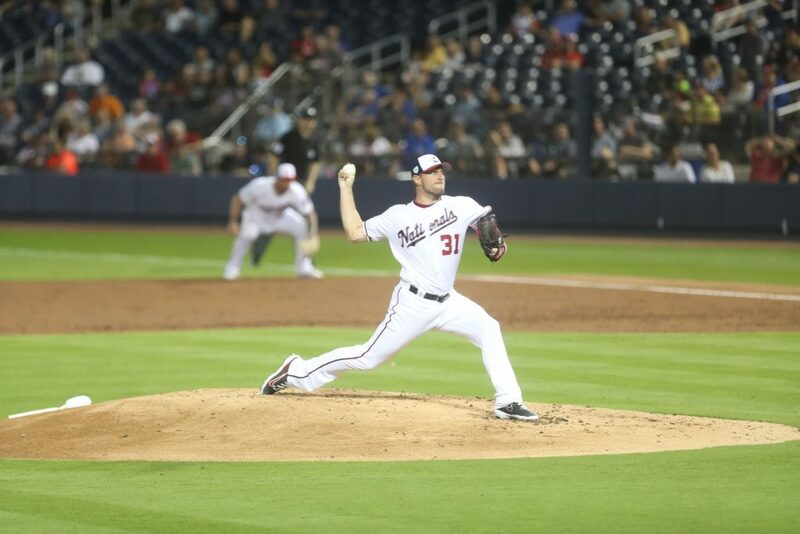 Then it’s back to the Northeast as the Nationals host the New York Yankees for an exhibition game Monday. Thursday is when the Nats’ season will begin. After today’s draw with the St. Louis Cardinals, the Nats announced their latest batch of roster cuts. Every remaining non-roster invitee — including Henderson Alvarez and Vidal Nuño, who once looked to have a puncher’s chance at making the team — was reassigned to minors camp save one, and the Nats also optioned starting pitchers Joe Ross (to Triple-A Fresno) and Erick Fedde (to Double-A Harrisburg), as well as catcher Spencer Kieboom (also Harrisburg). 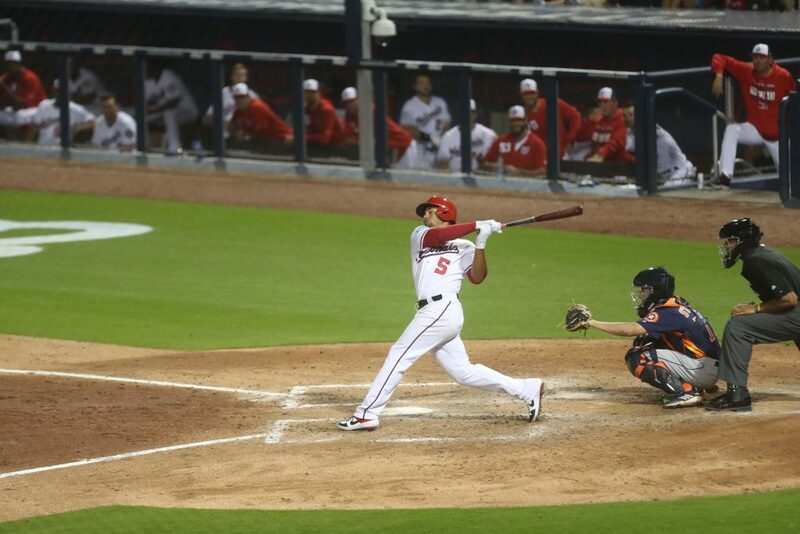 During the game, it was also announced that catcher Pedro Severino has left the organization altogether, as the Nats placed him on outright waivers and lost him to a claim by the Baltimore Orioles. Where does that leave the Nats? They have 29 roster players remaining in camp, plus non-roster invitee Jake Noll. 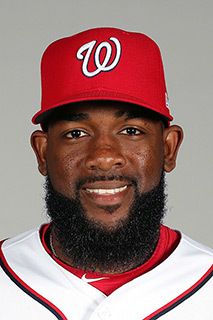 But although utilityman Howie Kendrick, center fielder Michael A. Taylor, and reliever Koda Glover have reportedly resumed baseball activities, they’re not expected to make the Opening Day roster. Without directly saying it, Rizzo suggested Kendrick won’t start the season on the active roster. Pointed out how he doesn’t like trying to get guys into “big league shape” in-season. Wants them ready before they join roster. So really, the Nats have 27 players who are vying for a spot on the Opening Day roster. Let’s break it down. This is an easy one. The Nats will trot out three-time Cy Young Award winner and future Hall of Famer Max Scherzer to face defending Cy Young Award champ Jacob deGrom on Opening Day. He’ll be joined in the rotation by big righty Stephen Strasburg, lefty Patrick Corbin, and crafty journeymen Anibal Sanchez and Jeremy Hellickson. Corbin, Sanchez, and Hellickson all signed deals with the Nats this winter. Hellickson ended up being the only free agent from last year’s team who re-signed. On paper, the Nats’ rotation is the true strength of this team. Scherzer, Strasburg, and Corbin are strikeout artists; both Scherzer and Corbin turned in Cy-caliber seasons last year, while the Nats will hope to a return to form from Strasburg, who struggled with injuries and inconsistency. Sanchez and Hellickson were resurgent last year after trending downward; the veterans don’t have big fastballs anymore, but they’ve learned to pitch without needing to blow batters away, and both have looked sharp this spring. What should concern the Nats is their unimpressive depth behind this impressive quintet. Fedde has always struggled above Double-A, and his results this spring were downright awful. Ross was better, but he’s battled no shortage of arm and shoulder issues in his professional career, most recently right elbow surgery in July 2017 to replace his ulnar collateral ligament. The Nats openly considered moving Ross into the bullpen to start the season, an acknowledgement both that his innings will have to be managed this season and that his fastball/slider mix plays up in relief while becoming decidedly hittable in the middle innings when he starts. Aside from Fedde and Ross, the Nats will stretch out Alvarez in Fresno, and they still have Austin Voth and Kyle McGowin as depth options on the 40-man roster. 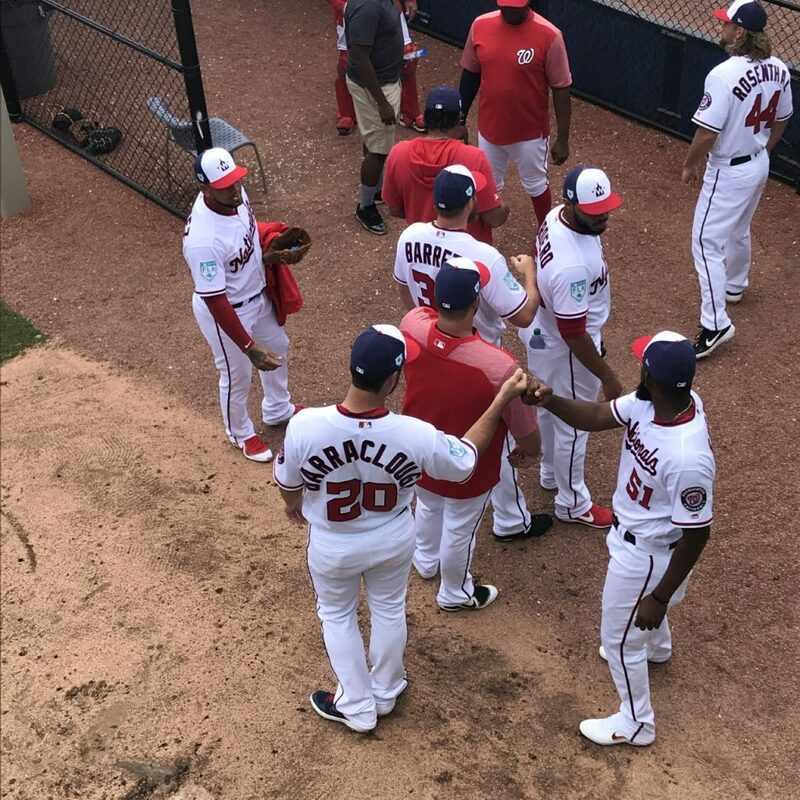 Further down, prospects Wil Crowe and Sterling Sharp wobbled their way through Double-A last year but will be looked to as the next young pitchers to emerge from the Nats’ pipeline. Realistically, though, if the Nats suffer a long-term injury to a starter, expect general manager Mike Rizzo to be active at the trade deadline. Another easy one. The Nats signed old friend Kurt Suzuki to a two-year deal early in the offseason, and they traded for All-Star Yan Gomes days later. Both are coming off standout seasons, and both have lit up opposing pitchers this spring, with Gomes in particular terrorizing opponents to the tune of a .400 batting average. Since Suzuki and Gomes were brought into the fold, Severino and Kieboom were never considered to have much of a chance at making the Opening Day roster. Both were cut today. Kieboom is still at the top of the organizational depth chart, and he retains his spot on the 40-man roster. 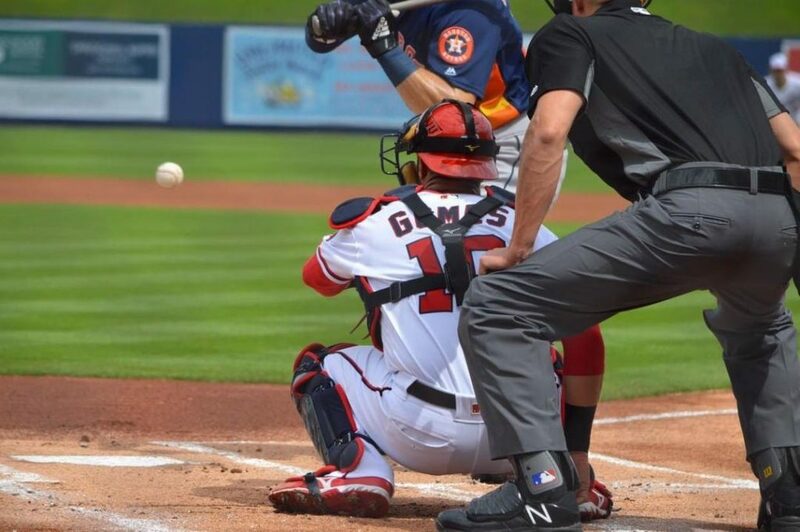 The Nats optioned him to Harrisburg to keep him close in case they need a catcher on short notice. While Kieboom wasn’t a menace at the plate last year, he did a credible job and began to display some power in September, which he carried into spring training. 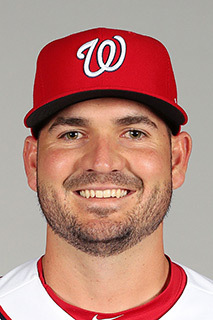 The Nats also have prospect Raudy Read on the 40-man roster, although he didn’t get much playing time this spring and wasn’t a September call-up last year, perhaps a sign of diminished standing in the organization after a suspension for using prohibited steroids. Beyond Kieboom and Read, Tres Barrera looked good behind the plate, if not at it, in limited spring action, and Taylor Gushue showed off a potent bat, although his receiving is still a work in progress. They’ll serve as break-glass-in-case-of-emergency depth options. Now we come to our first roster dilemma. The Nats know who their Opening Day starters around the diamond will be: Ryan Zimmerman at first base, Brian Dozier at second base, Anthony Rendon at third base, and Trea Turner at shortstop. They know that Matt Adams, re-signed to a one-year deal over the winter after a brief stint with the Cardinals, will be Zimmerman’s primary backup and could spell him against tough right-handed pitchers. They know that longtime utilityman Wilmer Difo will back up Dozier, Turner, and possibly Rendon. But if Kendrick isn’t back in time for Opening Day, the question of who takes his spot remains an open one. Today’s cuts give us little clarity. Noll, who is primarily a corner infielder, is the only non-roster invitee who remains in camp. Traditionally, the Nats have given at least one non-roster invitee a role on the team at the end of spring training. 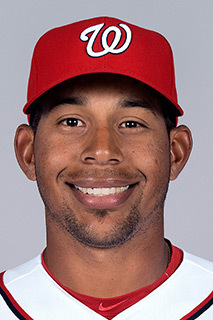 But the Nats have not yet optioned Adrian Sanchez, who has appeared at all four infield positions this spring and has parts of two major league campaigns with Washington under his belt. The case for Noll is simple: He’s earned the job. While his batting average has dropped some over the past couple of weeks, it still sits above .300, and six of his 15 hits have gone for extra bases. He’s turned in slick glovework at first base and third base, and he’s moonlighted at second base. No one really expected this from Noll — but TalkNats’ own Steve Mears had Noll as his “pick to click” at the start of spring training, and the 25-year-old has delivered. He’s worked extremely hard and done everything he possibly could to give himself this opportunity, and it seems the Nats are taking him seriously. He’s earned rave reviews from Nats coaches and even rival commentators throughout the spring. If the words “spring competition” mean anything, Noll has to get the job. As for Adrian Sanchez, he’s a known quantity for the Nats — as in, they know he’ll provide roughly replacement-level production, he’ll be serviceable at multiple infield positions (including shortstop), and he won’t be a serious threat off the bench either as a pinch-runner (he’s remarkably slow for a utility infielder) or a pinch-hitter (he has all of ten extra-base hits, none of them home runs, in 134 major league plate appearances). He’s basically Difo with less speed and even less power, and unlike Difo, he doesn’t switch-hit. With Sanchez, you know what you’re getting. It isn’t much, but you know what it is. With Noll, you’re hoping that he’s the guy from spring training, not the guy he’s been in the past. It’s a classic risk/reward scenario. Fortunately for the Nats, no matter who they pick, they’ll likely have a very temporary assignment, in a relatively minor role, before Kendrick can be activated. One last note on Noll: He can take the 40-man roster spot vacated by Severino without requiring a corresponding move. 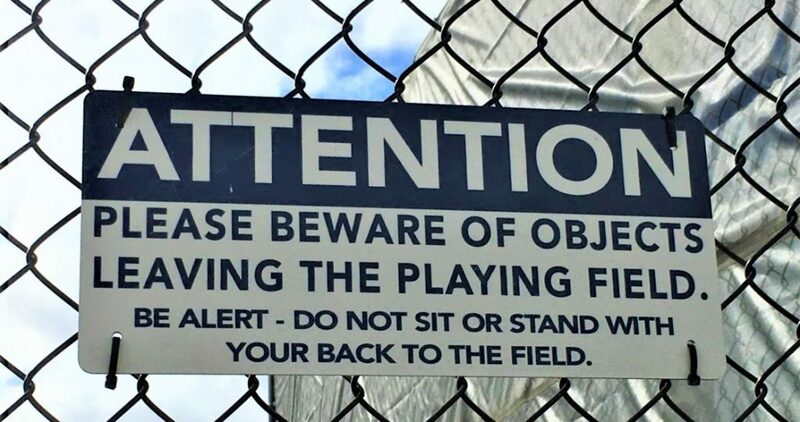 However, that would mean the Nats couldn’t use that spot for someone else (more on that in a bit). 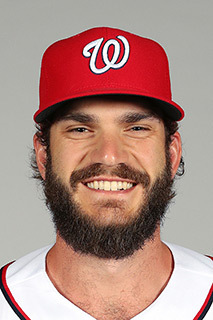 However, he’s eligible for the Rule 5 draft this winter, and if he keeps hitting once spring training is over, the Nats will likely want to protect him by adding him to the roster before December anyway. In terms of infield depth, the Nats just sent top prospect Carter Kieboom back to minor league camp. He had his ups and downs this spring, but he hit well and looked confident at the plate. Dozier is the Nats’ second baseman of 2019, but there seems little doubt Carter Kieboom will be the Nats’ second baseman of 2020. 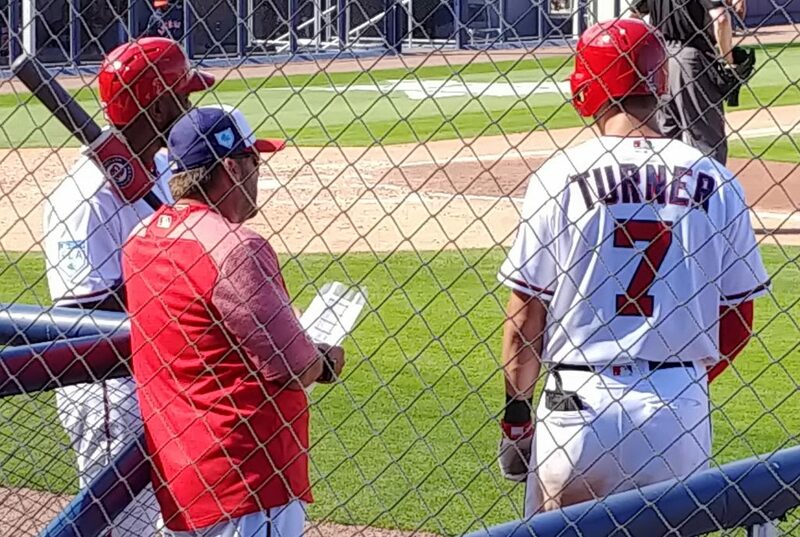 Otherwise, the Nats have some organizational depth in the form of utilitymen Matt Reynolds and Jacob Wilson, a couple of marginal first base prospects in Jose Marmolejos and Drew Ward, and another up-and-coming prospect in 18-year-old Luis Garcia, who also turned some heads in camp this spring. The depth here isn’t exceptional, but with so many players who can handle multiple positions, the Nats should be able to piece together a decent infield even if they have some injuries. Back to easy mode. 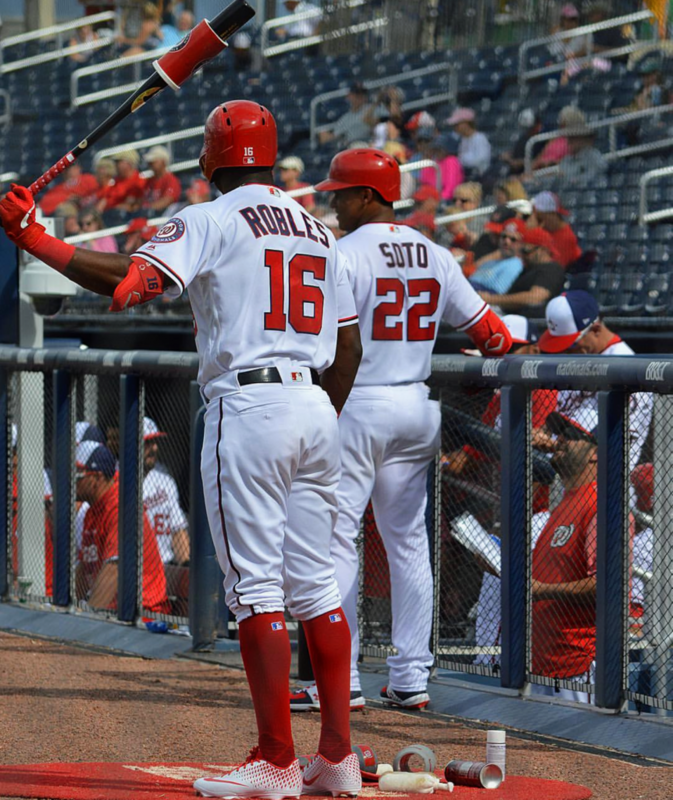 Taylor is injured, so any doubt that Victor Robles is not the Nats’ everyday center fielder is gone (plus Robles has scorched the ball this spring and looks like an early frontrunner for Rookie of the Year). To the left, Juan Soto will look to build on the best offensive major league season ever by a teenager, and to the right, Adam Eaton will just be trying to stay healthy, knowing that he can be a difference-making player just as long as he’s on the field. Assuming that Taylor indeed misses the Opening Day roster, the Nats will turn to post-prospect Andrew Stevenson as their fourth outfielder. It’s probably best to think of Stevenson as a left-handed, outfield-playing equivalent of Adrian Sanchez. Likely maxed out in terms of his development, Stevenson has never hit for any appreciable power, and his fielding can be flashy at times but is ultimately inconsistent. He’s good at bunting and runs the bases well. But as a major leaguer, Stevenson has been below replacement level, and he hasn’t done much this spring to suggest he’s about to turn the corner. The Nats will simply hope that Taylor’s quick recovery sees him back in action before Stevenson gets too much playing time. In the minors, the Nats don’t have much. Hunter Jones and Chuck Taylor were non-roster invitees to camp, but given chances against top-level pitching, they looked decidedly like career minor leaguers. Collin Cowgill, Yadiel Hernandez, and Tyler Goeddel are among the older, more experienced outfielders who have frequently been called over from minor league camp for a game, and each of them has had their moments, although their career statistics don’t suggest they are anything other than emergency depth. Fringe prospects Alec Keller and Austin Davidson turned in fine offensive seasons last year and could potentially be major league contributors — as could, perhaps, career minor leaguer Zach Collier. But in terms of steady veterans or top prospects waiting in the wings, the Nats simply don’t have them in the outfield. The depth here is a serious concern (more on that in a bit). The second obvious opening on the active roster is in the bullpen. The Nats know that Sean Doolittle is their closer, and they know that offseason acquisition Trevor Rosenthal is his primary setup man. Veteran southpaw Tony Sipp was acquired to replace failed prospect Sammy Solis, who never managed to put it together with the Nats before being released this spring. Former closer Kyle Barraclough was acquired in a cash deal with the Miami Marlins last fall, and at least on paper, he’s ticketed for some setup opportunities. 2018 contributor Justin Miller returns for another season. Longtime Nats lefty Matt Grace is back, too. That leaves one spot, and with Ross, Fedde, and the non-roster pitchers gone, it looks like it’s between right-handers Wander Suero, who spent most of 2018 in the Nats’ bullpen and had a solid rookie season, and Austen Williams, who had a breakout year in the minors but got beat up pretty good given a September cup of coffee. Both pitchers have turned in good results this spring, but Williams’ performance has been spellbinding. A slider that looked nothing like a major league-quality pitch last September has been employed to devastating effect all spring. The 26-year-old Williams has repeatedly come into tight spots and put the Nats back in their dugout with minimal or no damage. He’s retired 22 of 24 batters faced and has not been charged with an earned run. He went 1⅓ innings today against the Cardinals, retiring all four batters he faced and striking out three. In short, he’s looked like a major league reliever — a good one. Suero has been effective as well, but he hasn’t been nearly as dominant and he hasn’t pitched as many innings. Part of that can be chalked up to “working on things”, as Suero has developed a two-seam fastball to offset his primary pitch, a cutter that works between 90-93 mph. If he can get that going, throwing two fastballs that can touch the mid-90s, one with cut and one with run, he could be a truly scary pitcher. But his breaking ball is a work in progress, and so is the two-seamer. So there are a couple of questions working here. One, do you trust Williams has gotten right, that his bad results in September were perhaps a combination of stage fright, bad luck, and rookie mistakes over a small sample size, that he’s now ready for a real job in the major leagues? Two, do you trust Suero can adjust on the fly in what will be his sophomore season, or could he use some time in the minor leagues, in a lower-pressure environment, to work out the kinks with his slightly revamped arsenal of pitches? The important thing to remember here is that both of these pitchers have faced major league hitters, both of them are on the 40-man roster, and both of them are going to play roles in the Nats’ 2019 season and likely beyond it. The Opening Day decision is less like deciding which person you’re going to marry, and more like deciding who you’re going to dance with. Well, there is always the possibility that the Nats will make a late trade, sign a free agent who hasn’t found a team yet or got cut from camp, or claim someone off the waiver wire the way the Orioles did with Severino. In 2015, the Nats were also dealing with some injuries. As they prepared to break camp, they added two outfielders in one day: veteran Reed Johnson, a non-roster invitee whom the Marlins had cut, and rookie Matt den Dekker, whom the Mets were willing to trade for lefty reliever Jerry Blevins. There are players available now, and players who will be available in the next few days. The Nats do have an open 40-man roster spot. They could decide it would be put to better use shoring up their bullpen or outfield depth, rather than awarding it to Jake Noll. There has been no indication that they are active on the market or scouring the waiver wire at this point, with Kendrick and Taylor’s injuries expected to be short-term and the bullpen already bolstered with the late signing of Sipp, who is expected to be ready by Opening Day. That being said, Mike Rizzo likes to run silent, and a flurry of activity in the final days of the offseason can’t be ruled out altogether. This entry was posted in Analysis, Roster, SpringTraining. Bookmark the permalink.